To be the only one to get down a bus and walk down quietly at 7.30 am in a sleepy, strange, quiet village tucked in the mountains is an inexplicable sensation. You already know it’s going be all adventure! Before I went for my solo travel, I penned down my thoughts in this blog that you might want to read to connect to what am writing about. My destination was Bir. A small village in Himachal Pradesh. Bir is beautiful, non-commercial, not heavily crowded and has mind blowing sunsets, and above all is SAFE! . More on being the solo traveler – later! The morning I arrived in Bir, I suddenly didn’t want to settle down into any writing or walking. I was restless, I remember! I settled into a beautiful camp, but my mind was out in the mountains. Like someone was waiting for me! I was craving excitement! Adrenaline rush…even though Bir is world famous for Para Gliding, I had done that before twice. I wasn’t feeling the excitement there either! So I contacted a young fearless girl by the name of Nupur, 31, who is a co-founder of an organisation by the name of Hell Race! Check out what they are upto. 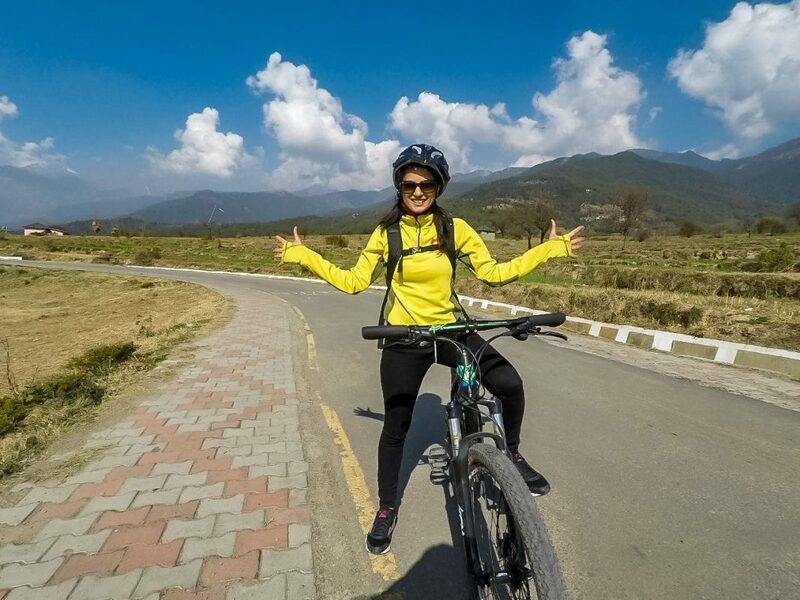 Nupur moved to Bir 2 years back, is now a local and does things you and I mostly dream of (endurance running, ultra running, mountain biking, solo treks)! She suggested, I tried – Mountain Biking! Bir is surrounded by beautiful monasteries and So I decided to cover the Monasteries and a few cafes of Bir on my bike! Nupur became my tireless guide and off we went! While the Pics are here for you to see, this is exactly what I did, felt and thought! And maybe you could plan a visit to Bir too! Rode 21km up and down that day. If my fitness levels were any lesser, I won’t have been able to do this. Found myself getting off the bike and dragging it at various steep slopes. It’s a killer workout ! I was on my bike for 6 hours that day – on and off! Wow and Phew! The second day I did 11 kms of biking. Am a runner at heart and feet! But the interesting thing about biking in the mountains is that you get around a lot. You can explore many places on your bike. I still love running more (maybe it’s my comfit zone)! But am excited to be on the bike! Saw 2 Monasteries and 1 Buddhist University. Each monastery is a treat to the eyes and the soul. The open spaces, the sunny blue skies, the architecture and the vastness of them all. Enthralling. You could just google the names of the Monastaries, get a bike and go! The Tibetan food is the flavor of the place and you shouldn’t think two hoots entering a good place that serves it. Bir has beautiful cafes – I went to 3 cafes. Garden Cafe and Cafe Silver Linings! Charming! The third had great food but I was too lost to ask the name! My Go Pro and Nupur have done a fabulous job with the pictures! Eat, get on a bike, get off, eat more, Ride MORE! And here is one pic with Nupur – super adventurous and super camera shy!